I would like to wholeheartedly recommend the VirtualDive technology which has the capacity to completely change the way the way we are connected to and have knowledge of the world’s oceans. For example, in Australia the Great Barrier Reef is suffering because it seems remote from our everyday lives and the ongoing deterioration is somehow theoretical and removed from our day to day concerns. VirtualDive can dramatically change this situation by bringing to all internet users a continuous update of what is happening on and to the Reef. Suddenly it would be part of our everyday life and the voices for action would be magnified and directed to the politicians who make the decisions. This is democracy in action. 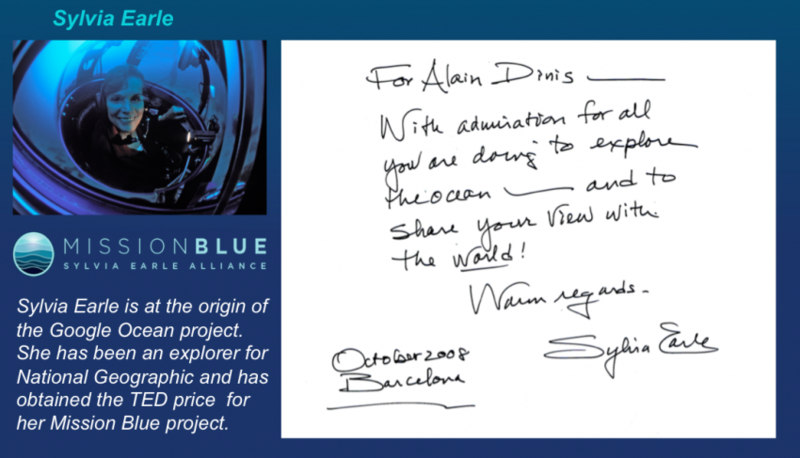 Alain Dinis is to be congratulated on the huge potential for great outcomes in the application of VirtualDive technology. Facilitate the access to nature for handicapped persons, for families, for children and for seniors, share together the richness of fauna, of flora and the emotion linked to the beauty of preserved landscapes, are essential missions for National Parks of France. At Port-Cros, first Marine Park of Europe, the major difficulty is to make the sub aquatic environment accessible to all. The discovery of this environment requires physical conditions and technical skills. By creating in 1979 the first underwater trail in France, the National Park did solve partially this problem. But how to allow our young visitors and persons with a handicap, to enjoy the multisensorial experience of diving? In 2010, the National Park of Port-Cros welcomed the start-up “VirtualDive”. Immediately convinced, the National Park of Port-Cros got associated with their innovative project of virtual reality. The project of making the mythical diving site of “La Gabinière” accessible to all was just born. After the phase of development, during which the prototype evolves towards a ergonomic console, the National ParK acquired two interactive consoles, thanks to the support of the foundation of the firm GMF and of Var’s General Counsel. The system, named Dolphyn, is based on the principle of virtual and augmented realities. The console, mobile and watertight, offers the opportunity, through its monitor, to discover and explore the sea depths, remaining at water surface. Visual and sound perceptions are multiplied by body feelings associated with the simultaneous water immersion. Thanks to the partnership established with the company VirtualDive, the little Parisians will be able to discover in a swimming pool, the exceptional marine biodiversity of the preserved depths of the National Park during the first quarter of 2014, through a unique sensorial experience where real and virtual are merged and become interchangeable. Therefore, a swimmer equipped with a Dolphyn, will get transformed, during his swim, to an experienced diver moving along the underwater fallings of the National Park of Port-Cros. The user may also, for instance, try an edutainment experience of recognition of different singing whales of the waters of the Park. During spring 2014, these discovery tools will be adapted in coordination with re-education centers, for therapeutic usages. “The visionary objective of Digital Ocean is to “open, to billions of people worldwide, access to ocean depths, at anytime, anywhere thanks to Information Technologies such as online collaborative platform, Virtual Reality, simulation and serious gaming ”. VirtualDive has developed among the Digital Ocean project a set of software solutions that allow the diving community to collaborate online in editing interactive virtual representations of diving sites based on real 3D bathymetrical data and enriched with scientific and multimedia information. Those solutions are very interesting for PADI (Professional Association of Diving Instructors) as our organization is the world’s leading scuba diving training organization and is involved in environmental missions with the Project AWARE Foundation, a nonprofit organization dedicated to conserving underwater environments through education, advocacy and action”.